In the Spotlight: Friends in Service Here, commonly known as FISH of Sherman, is celebrating its 45th year of being in service to the community, and this is no ordinary feat! Since the non-profit’s founding in 1971, they have been providing residents who can’t drive with free transportation to medical, dental, and legal appointments in neighboring towns. Putting this in perspective, over 500 passionate and dedicated volunteers have collectively covered 16,400+ days, driven almost 200,000 miles, and answered over 6,000 phone calls, shared Barbara Hoag, FISH’s statistician. In order for FISH to stay up and running every day of the year, they need approximately 50 volunteer drivers and phone persons to be scheduled throughout the year. Although most of the people who need their help are the elderly, absolutely anyone can use the free service who can’t drive and doesn’t have a ride to an appointment. Behind the scenes, their service coordinator, Melinda Albert, distributes the messages, and every day there’s a phone person on duty who makes sure that all requests coming in are covered and the driver of the day is alerted. Carol Faure, a former FISH Secretary of the Steering Committee for 15 years, is a perfect example. For 17 years, she was also a volunteer driver and phone person. Today, she still volunteers as a phone person. However, she can no longer drive and uses the service herself on a regular basis, along with about 30 other regular clients. “The importance of this organization to the town of Sherman is critical because it helps to make it possible for seniors to stay in town in their own homes, especially since there’s no public transportation,” says Mrs. Faure. What was true 45 years ago, still holds true today. As long as there’s no public transportation in Sherman then residents can rely on FISH for a free ride that’s provided for by volunteers who use their own gas and vehicles to transport those who need the service in non-emergencies, as they are not community first responders. Through the decades, FISH of Sherman has achieved several milestones. Some of the many highlights include being honored with a proclamation for its 25 years of service to the community on September 6, 1996 that was issued by the Former First Selectman of Sherman, Anthony Hapanowich. On September 19, 2003, Former Governor Jody Rell presented the State Treasure Award to the FISH Steering Committee. Then, on November 29, 2006, both Helen and John Bethel received the Partnership Award given by the Western Connecticut Area Agency on Aging for their noteworthy contributions to the community. Mrs. Bethel was recognized for being one of the founders of FISH of Sherman. She volunteered her time serving as president, secretary, statistician, and scheduler through the decades. Mr. Bethel, too, was also recognized for his many years of volunteerism within the organization. In more recent years, Mr. Hollander says he’s glad FISH expanded and they now loan out medical equipment; like canes, crutches, walkers, and wheelchairs, to anyone who needs them. Right now, he oversees this service that helps about 20 people per year, and he credits John O’Connor for its inception. 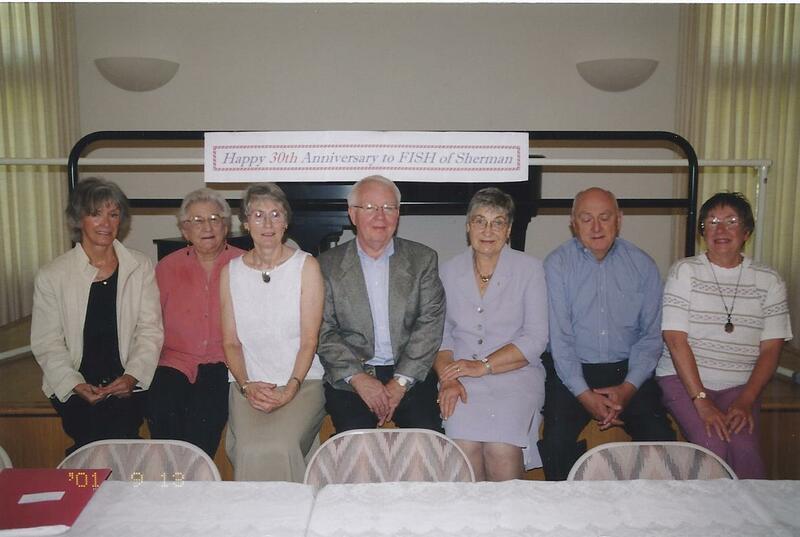 By far, both Mr. Hollander and Mr. Chiaramonte agree that the biggest accomplishment of all is the fact that FISH of Sherman is still in existence and has enough volunteers to keep it going. Back in the day, there were several unaffiliated chapters throughout Connecticut that started around the same time, and it’s believed that most of them no longer exist. Mrs. Bethel, now the only surviving FISH of Sherman founder who dedicated 40 years of service to the organization, once wrote in detail about the history of FISH in the local newspaper. She cited an article entitled, “Give Yourself for Christmas,” which appeared in a December 1972 issue of McCall’s Newsletter for Women. In a phone conversation, Mrs. Bethel, who now lives in Ohio to be near family, shared some insight into how FISH began in Sherman. Mrs. Bethel says that Barbara Schaefer, FISH of Sherman’s first chairwoman, introduced the organization to Cal Ukena, the pastor of the church. Soon after, they officially formed their own chapter on November 17, 1971. She recalls how the original Steering Committee members were herself, Barbara Schaefer, Flossie Ukena (the pastor’s wife), Robert and Ann Davies, Charlie Reppenhagen, Pierce Beaver, Bluie Piel, and Ruth Duell. Mrs. Bethel says “as long as Sherman is without public transportation, it is vital that our organization continues to function and be available to those who need it. And that it has the support of the town’s people.” These words resonate especially well with FISH volunteers and those who have used or continue to use this much-needed service, which is a 45-year blessing to the community. If you’d like to get involved helping neighbors… FISH of Sherman always needs “a good list of drivers.” This winter, they especially need “reserve drivers” because many of the volunteers go away to warmer places for the season. Their service area is typically within a 20-mile radius, and for obvious safety reasons, trips will be cancelled in inclement weather. Please contact Mrs. Barbara Hollander with any questions because she is the trainer for all new volunteers: 860.354.6423. FISH is funded by the Town’s state transportation grant and private donations. To make an online donation to their “rainy day fund,” visit: www.fishofsherman.org. Or, mail a check to PO Box 311, Sherman, CT, 06784. This article is by Alicia Sakal, originally written for Town Tribune. FISH logo: Contributed. Flashback photo: Courtesy of the Sherman Historical Society.